I have eaten the heart of a lamb. And you know what? Its innocent little heart was delicious. It tasted a bit like kidney, just a tiny bit like liver, but better than either. I cut off most of the tough white fatty bits, chopped it up and ate it with some fava beans and a nice… Sorry, with another stir fry. 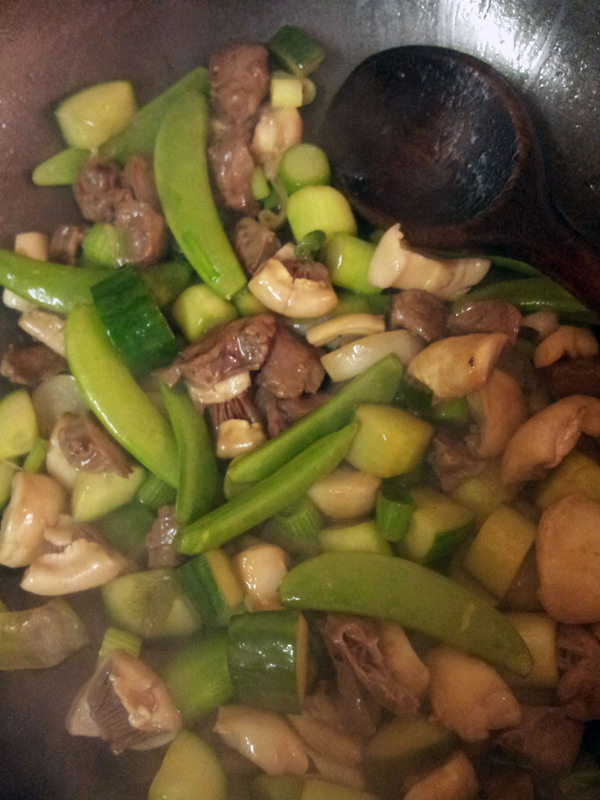 Other ingredients, in approximate order of being added to the wok, were cucumber, leek, scallions, sugarsnap peas, mushrooms, cherry tomatoes, aubergine (egg plant), and broccoli. It was wonderful, a deeply satisfying fry. So nice to get a really excellent aubergine – this one was like a purple balloon full of helium foam – but all the veg was good. With the exception of the broccoli though, none of what I bought this time was organic. This is because what the supermarket had wasn’t local. I mean, even in the sense that European is local. Seriously, the organic avocados were from Brazil, the apples New Zealand! Clearly as a meat-eater I am by no means the keenest of environmentalists, but I cannot understand people thinking they’re being all natural and Earth-friendly while selecting food that comes with air miles. Perhaps to counterbalance all the manly meat-eating, I also planted some flowers today. Petunias – surely the campest of all the bedding plants. A lovely rich blue-purple in colour. I’m not sure what possessed me. As far as I recall it’s the first time I’ve ever done gardening without being asked – unless you include houseplants. Maybe it was just for a complete change. I’d spent the previous forty-eight hours working on an article about “Big Data”, a fashionable concept from the world of business and technology. I guess I needed a bit of nature after that. Do the vast amounts of data created and accumulated in the course of business really contain priceless knowledge? Well, I guess you don’t know until you look. Mike Huckabee is sending me email. Why, I don’t know. I could not care less what the man thinks. Calls himself a “Conservative Christian”, which apparently means that he was enjoying the Bible right up until Jesus came along and spoilt it. Mike wants me to know that a bunch of people in robes are not more important than God. This isn’t an anti-Islamic thing, he’s referring to the US Supreme Court and their judgement that some laws against Gay marriage were unconstitutional. He argues that they must be wrong because his God doesn’t agree with Gay marriage. This shows that he either doesn’t understand or doesn’t care for the constitution of the United States. Both, I suspect. So I’m not an American voter. Was this sent to me by mistake? I get mail intended for other Richard Chapmans (Richards Chapmen?) all the time. I’m not sure; American conservative Christianity is not just a mixture of politics and religion. It’s also a business. Witness the fact that a while after this, along came another mail from Huckabee. Only this one began “Please find a special message from our paid sponsor”. Mike Huckabee’s political spam has breaks for commercials. It was headed “Sopranos Star Ignored 4 Signs of Imminent Heart Attack, Doctor Says”, and was designed to terrify you into some dubious heart-health scheme by quite literally cashing in on the recent death of James Gandolfini. Classy. Interesting to note though, Outlook’s filters decided Huckabee’s advert wasn’t spam – but that his politics was. I think I see where they’re coming from. Dr. Crandall says that if you ever suffer a heart attack outside of a hospital, you only have a 7 percent chance of survival! That also means in 93 percent of the cases such an episode is fatal! No comment of mine could add to that in any way. Yes, all organised religions from Scientology on down are commercial entities. But the US religious right, seeing as it does no real distinction between Christianity and Capitalism, is among the least embarrassed to blatantly seek “customers”. These don’t necessarily have to be American voters as long as they can raise the funds and spread the programme. Witness “our” Youth Defence, in many ways a bridgehead into Ireland for American Conservative Christianity. (And one to which an outflanked Catholic Church has still to find an effective response.) So there’s every possibility that this mail reached me intentionally. Pointlessly, but intentionally. I don’t often cook properly, so when I do I… Well, I get inordinately pleased with myself. I’m house-sitting at the moment, which means I have some time on my hands and a decent kitchen at my disposal. Normally I can never be bothered to cook for one and, like old photographs, only bring out the culinary skills when I have guests. But if I’m going to be here for a week or more I need to get into good habits. I don’t want to wind up eating out of tins. At least not directly. A lot of vegetables in the fridge that were not going to look appetising for much longer. (That cucumber in fact needed CPR.) So stir fry! I used to be notorious for these, but nowadays don’t even possess a wok. There’s one here though. 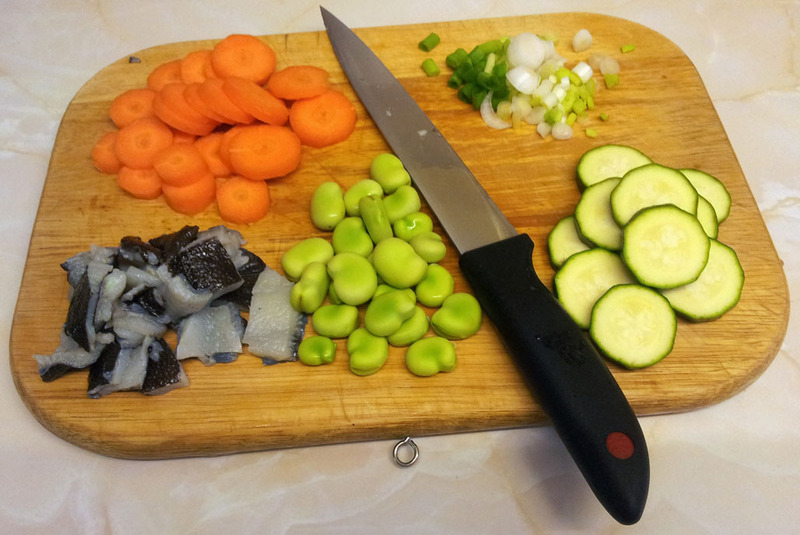 Ingredients: Carrots, cucumber, scallions, broad beans from the local organic farm, and Unnamed Fish. I’m not clear what it is because I bought a special-offer lot of mixed frozen fishes. Probably plaice. Herbs: None, and certainly no spices. Just soy sauce and olive oil in the cooking. Directions: Chop up, make hot and slap about. “Nice.” Jesus. I’m never going to make it as a food critic, am I? Among the more pointless things I’ve done recently is install a blacklight CFL in my bedside lamp. This is to encourage me to take up reading books again. Do you follow? It’s a simple idea really. I’ve grown so used in the last decade or so to reading from screens that paper seems a bit weird now. But turn on a UV lamp and what happens to a book? 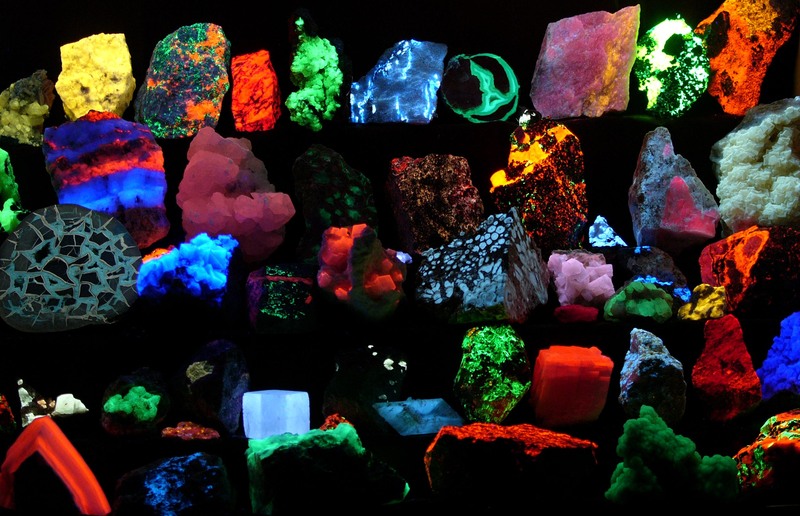 It glows. Like a screen! Bleaching agents in the paper must make it fluoresce. Not all the fibres seem to have it equally though, and the page takes on an oddly speckled, grainy look. It is bright enough to read by though, just about. All right to be honest this isn’t really why I got the bulb. I bought it because I’d never seen a blacklight CFL before, it wasn’t expensive, and I thought it was too interesting not to buy. In action it seems more violet than invisible, but white things around the room glow in an eerie way. The shirts I have hanging look particularly fierce, and the pale neon emanating from my map of Europe hints at the trippy possibilities. This all gives the room an… interesting look – somewhere between clinical laboratory and tatty ghost train. And I notice that it actually makes the photochromic lenses of my glasses go dark, so it really does seem to put out a healthy (?) amount of ultraviolet light. Perhaps if I sleep with it on I’ll get a tan this summer. Some more photographs of our mystery bee-wasp, which I think will clinch its species. The puzzle only really begins there however. Here from the back, it’s difficult to distinguish Hasdrubal from a honeybee. With her deep brown abdomen you can only just make out the wasp markings. Lookit her little stinger! You can hardly see that with the naked eye. Which is perhaps as well considering how much I had to handle her. Sorry about the soft focus incidentally, this was really pushing the Note’s 8Mpx camera to its limits. Though I have to admit it’s not technically impossible to take sharp close-up pictures with it, merely humanly difficult. Depth of field becomes negligible while shake is amplified. From the front it’s a different story, there’s zero doubt that this is a wasp. The face is absolutely typical. As are the antennae and slender legs. And, incidentally, the hair. In my mind wasps are as smooth as spray-painted steel, but this research has shown me that they’re really quite fuzzy. I guess it’s the (normal) black-and-yellow markings; nature’s alarm signal makes you oblivious to a wasp’s cuddlier aspects. Or at least keeps you too far away. We also see where H.R. Giger got a lot of his inspiration. Brr. What species of wasp though? Thanks to Bruce Ruston of Blue Platypi Photography who sent a link to this great wasp ID chart, I’m almost certain that Hasdrubal is a common wasp. She has the distinctive “anchor” on her face. The only other variety that looks a lot like this is the red wasp, but its thorax markings are quite different – as we see in the shot below. So Hasdrubal is almost certainly a common wasp – except she’s simply the wrong colour. The question then is whether this falls within the normal variation of the species, or if she’s some sort of freaky mutant. That it’s possible to get tolerably sharp macro shots with this camera is demonstrated by this final one, in which I thought to ask Hasdrubal herself what sort of hymenoptera she is. Any entomologists in? I came across a curious thing. The rest of you, don’t scroll down if close-up pictures of stingy insects disturb you. Or indeed offend you – it is naked after all. And dead. I really wouldn’t look. OK now the wusses are gone, what do you think is going on here? It’s a wasp, coloured like a bee. Definitely vespine in its shape and features, with the pronounced segmentation and aggressive I-am-nature’s-attack-helicopter angles. But instead of the usual biohazard yellow it has the warm goldie-browns of a honeybee. Well, makes a change from all the cartoons you see of bees coloured like wasps. I don’t have a camera for macro photographs, but got surprisingly good results with the phone. The problems were holding it steady and getting the background right. In the end I put it in a glass jug; this gave me something to rest the phone on and allowed me to shoot over different surfaces. As the phone compensates to keep an average brightness, the creature looks a lot brighter when shot against a dark background. (I could’ve tried different camera apps that allow you to meter light more precisely, but this was quicker.) In the first one here therefore it actually looks a lot more yellow than it really is, and so more like an ordinary wasp. But it brings out the detail well. White backgrounds on the other hand make Hasdrubal – I call her Hasdrubal, for reasons which remain unclear to me – look virtually black. The woodgrain one to the right (taken without benefit of the jug) probably gives the best impression of how she appears to the naked eye. If anything, a little darker than a honeybee – but with similar golden hair. Which is the odd thing. Whoever heard of a hairy wasp? Bees wear a fluffy bolero but wasps, so far as I’ve noted, are shiny-shaven. As you can see, particularly in the first pic, this one has no end of fuzz. I can find no species that fits the description. The European Hornet is a little hairy, but a lot more wasp-coloured. A mutant? Diseased? I have no idea.